In case you do not have yet a plane ticket yet, you can find pretty good deals from all corners of Europe, as there are few airports nearby : Pula / Trieste / Rijeka / Ljubljana / Treviso / Zagreb. Low cost companies landing directly in Pula include : Easyjet, Vueling, transavia.com, Germanwings, Ryan air (listings here). If you do not find anything good, car sharing platforms such as www.blablacar.com could be a great help. A Goulash Car Sharing Facebook Group has just been set up fo that reason too. Prices : As our crowd is completely mixed between locals and foreigners (we are proud to be the only festival properly connecting both worlds! ), prices will be local. Good news for UK people : Half liter of beer will cost you only 1,5£. Goulash is a collaborative festival by essence -as crowdfunders, you know it :) If people are interested in volunteering before/during/after the festival, you can send an email to [email protected] Selected volunteers get free festival ticket and few more extras. Online help : You probably know people that are Goulash minded. If this is the case, we would REALLY appreciate if you take a few minutes to invite the right people to like our page, and suggest them to attend the festival. Goulash is a big word of mouth movement and we appreciate if you help us spread the word in the right direction! Both links are below. Thank you for reading through and helping us making this festival so special. Now that you made it to the end, treat yourself with a Playlist 100% Goulash Festival 2015! 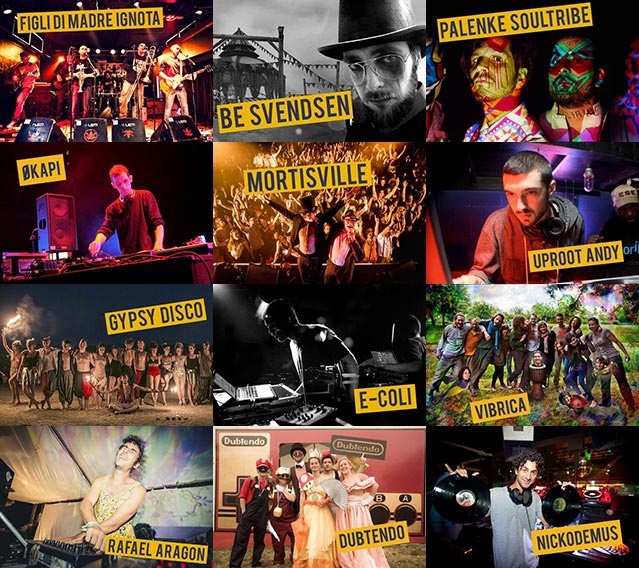 Goulash Festival 100% Funded // First lineup announcement! As promised, here are the first batch of names booked for the festival. In total, we'll book around 60 acts going in every direction possible : Global Bass, 8 Bit Polka, Electro Cumbia, Glitch Funk, GypsyBass, Psydub or Ska Hip hop, to name a few! Gypsy Disco : Circus (UK) - They sing, dance and get naked, what more do you need? Nickodemus : Global Music (USA) - With a wide range of music, from international dub & downtempo to house & electronic, Nickodemus is a big inspiration for the whole Goulash family! Okapi : Gypsydelic (Italy) - ØKapi's amazing skills at sample mixing are simply outstanding and during Okapi live sets he mixes: techno/broken beat/electro-/8-bit with melodies from Klezmer, polka, children's music, idiot pop and hawaiian classics and lot more. Palenke Soultribe : Cumbia/Electro/World (USA) - Palenke Soultribe deconstruct atmospheric and warm colombian sonic textures that ride over underground beats and exploratory synthesizer sounds. The foundation of PST's work is the colorful sound of Colombia's traditional music mixed together with electronic beats. Manushka : Gypsy/Ska/Swing (UK) - Boasting an array of live instruments including, Trombone, Saxophone, Flute, Accordion, Synth Bass, Banjo, amongst others. 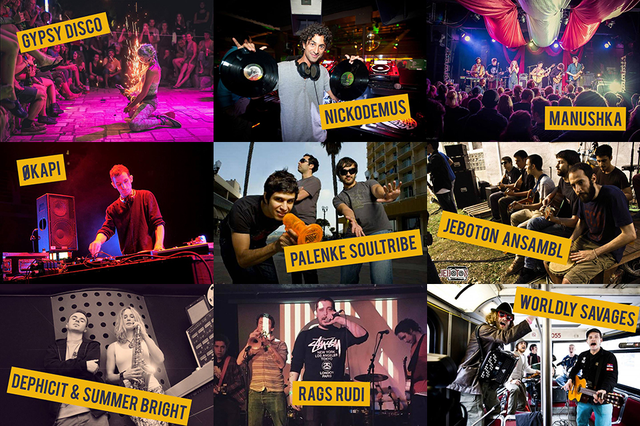 Balkan, Gypsy, Ska and Reggae are some of the many genres that this eclectic band draw their musical mega sounds from. Their offbeat vibes are made for moving the feet and causing raucous, rambunctious stomposity. Tannu Tuwa : Live electronic music (Croatia) - Exploring the limitless musical landscape and experimenting with acoustic and electronic approach, Tannu Tuwa reaches deep into an untapped resource of infinite auditive phenomena. Worldly Savages : Folk-Punk (Serbia) - Contagious folk-punk energy with ethno music spiciness. Wild music with a strong message to fight boring post-modernity! Rags Rudi : Ska Hip Hop (UK) - Rags Rudi are seven young East Londoners blending the party-sparking vibe of ska, headiness of hip-hop and politicized chaos of punk into a sound as diverse and uncompromising as the city that raised them. Dephicit & Summer Bright : Ghetto Sax Glitch Funk (UK) - With a formidable blend of turntablism & live saxphone, Dephicit and Summer Bright are taking the underground head on with their finely tuned glitch & ghetto-funk sound, bridging raw jazz, funk and swing elements with alien basslines and rawkus beats. Jeboton Ansambl : Ethno Accoustic (Croatia) - Jeboton ansambl is a collective of 6 bands that play acoustic versions of their songs, ranging from ska and reggae, ethno, to psychedelic rock. LOT MORE AWESOMENESS TO COME...Stay tuned!! We are nearly there! 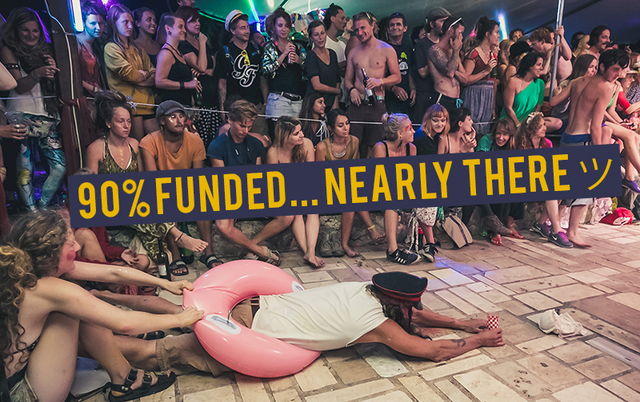 Thanks to your massive support we have already funded 90% of the project, in 15 days. 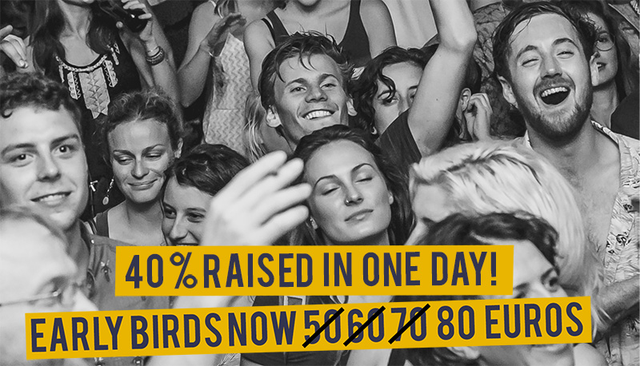 All the early bird tickets are gone, and we now introduce the 'Late Bird Ticket' : for 100€ donation, the backers will get a festival ticket, but also a Goulash T-Shirt or Vinyl. Group tickets are available : 5 tickets for 400€, or 10 tickets for 700€. If you want to help going beyond target with the crowdfunding, do not hesitate to share our campaign and/or invite your friends to the Goulash Festival Facebook event! 40% raised in only one day! And if you want to help us with fundraising, do not hesitate to spread the word by sharing the link with your friends : http://www.ulule.com/goulash2015/ . The more we raise, the more we are, the better the festival! Blessed to have you all, you mad bunch!